Historically, Oregon’s southern Willamette Valley was dominated by wet prairie habitat and oak savannahs. Beginning in the mid 1850s, much of the fertile land was converted to agricultural use and urban development, causing fragmentation and degradation of wet prairies. Currently, intact wetland prairie habitat covers less than 1% of its historical range. Wetlands provide vital habitat to numerous species of invertebrates, amphibians, and waterfowl. Plant diversity tends to be high in wet prairies, but invasive pasture grasses have posed a difficult management issue as they crowd out native grasses and forbs. A major restoration challenge is restoring wet prairie habitat to a level at which it can maintain resistance to invasive species. There have been several sensitive and listed plant species documented within the West Eugene Wetlands (WEW), including Willamette Valley Daisy (Erigeron decumbens), Bradshaw’s lomatium (Lomatium bradshawii) and Shaggy Horkelia (Horkelia congesta). There are also several populations of the threatened Kincaid’s lupine (Lupinus oreganus), which serves as the host plant for the endangered Fender’s blue butterfly. Many of the wet prairie sites within the WEW have the potential to serve as critical habitat for Fender’s blue butterfly. Common native grass species in the wetlands include California oat grass (Danthonia californica) and tufted hair grass (Deschampsia cespitosa). 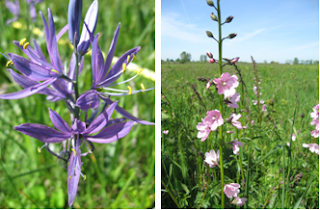 Common forbs include camas, saxifrage, sidalcea, brodiaea, and wooly mule’s ear. Several introduced grasses and forbs, including pennyroyal, velvet grass, tall fescue and creeping bentgrass, pose major threats to the native plant populations and must be routinely monitored. IAE takes part in the West Eugene Wetlands Project, a cooperative effort between federal, state, and local organizations, to restore and manage valuable wet prairie habitat in and around the city of Eugene. The WEW Project has successfully protected and restored over 3000 acres of habitat, providing opportunities for education, passive recreation, and habitat for listed species. In cooperation with the BLM, IAE conducts yearly sampling at a handful of the wet prairie sites. The BLM uses data about introduced species cover, woody species cover, litter build-up, and native species diversity to ensure that their management goals, in agreement with the Oregon Prairie Species Recovery Plan, are being met. Five different sites were visited in May 2012. 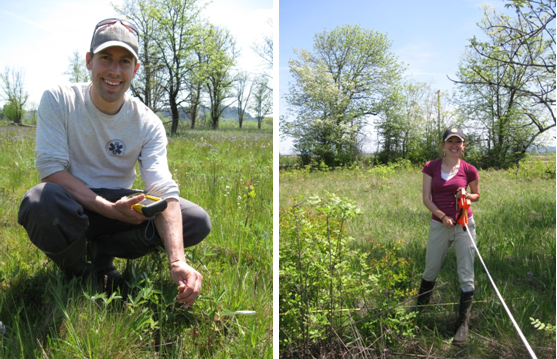 The IAE field crew uses point-intercept sampling to provide an unbiased quantitative description of vegetation categories. One of the sites, Greenhill, had been ecologically burned in the fall to reduce woody coverage and stimulate growth of native species. The plant community at this site appeared to be very robust and many of the native forbs had responded well to the controlled burn.